The five largest U.S. cities fell in favor among investors as secondary markets with blossoming tech hubs proved ascendent, according to the latest “Emerging Trends in Real Estate” study from PwC. Seattle, America’s 18th largest city and the home of Amazon, rose from the No. 4 position to clinch the top spot in PwC’s survey of 1,600 property owners, developers and lenders. 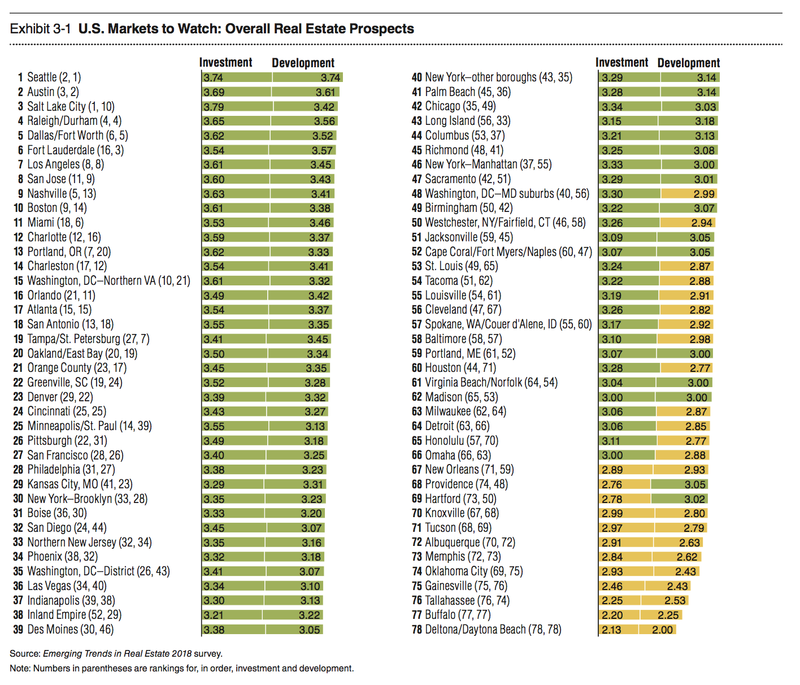 That’s in keeping with other metrics like home appreciation, where Seattle leads the nation. Meanwhile, San Jose, Raleigh and Boston, each with their own sizable tech sectors, climbed steadily. New York City, Los Angeles, Chicago, Houston and Phoenix all dropped precipitously, with Manhattan plummeting from 13 to 46 while the Windy City dropped from 19 to 42, according to the well-regarded study, issued annually by PwC and the Urban Land Institute. A young, educated workforce and an overabundance of capital elevated Seattle to the top spot. Survey participants noted a positive outlook for all property sectors in the city, with the strongest outlook for investment and development in industrial and single-family housing. Raleigh and Durham, meanwhile, jumped from seven to the No. 4 position thanks to high confidence surrounding commercial property and single-family housing as well as strong housing affordability, the study noted. Home to open-source giant Red Hat and software provider Citrix, 5.2 percent of Raleigh’s total employment is comprised of tech-related jobs, according to PwC. San Jose, which earlier this year ranked at the top of online job search company indeed.com‘s annual list of tech cities, rose from 17 to 8 on the “Emerging Trends” list, in part thanks to growth in the multi-family, industrial and hotel real estate segments. Home to Adobe, Ebay and PayPal, and not too far from Apple’s hometown of Cupertino, San Jose also ranked strongly in investor demand, local economy and education. Rising prices and dwindling supply weighed heavily on investors who downgraded the largest metropolitan markets, but so too did pollution and, in New York, the risk of flooding. More affordable housing in secondary markets, they noted, may draw younger generations to locales like Charlotte and Austin, the latter of which dropped from first place to second in the latest study.